Valpuri Innamaa, an irrepressible renaissance woman. Woman. Entrepreneur. Wife. Merchant. Mother. Matron. Lover. Ship owner. Friend. Landholder. 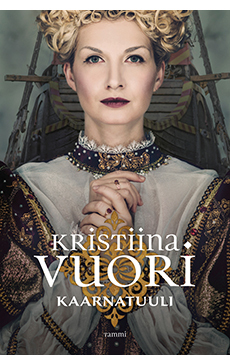 Valpuri Innamaa, the most successful burgess of 16th century Turku, didn’t allow her gender stand in her way. The story begins from the scaffold, in 1563, where the burgher Henrik Innamaa awaits his punishment for treason. Meanwhile, the troops of King Eric XIV are surging into the city. Innamaa’s manor is taken, its riches plundered, and his pregnant 20-year-old widow driven out into the elements with her little girls. But Valpuri is not easily discouraged. She demands justice, and fears neither the noblemen nor the aristocrats who have robbed her, not even the king himself. Before long, she is Turku’s wealthiest burgess, owns ships, land, fur farms, and mills, trades at home and abroad. All of this, in a time when a woman was considered less than a man in the eyes of both the church and the law. Valpuri Innamaa was a historical figure whose life was more colourful than the strangest fiction. A sharp-tongued and successful woman, Valpuri was the object of both envy and revenge. And, of course, love.